U.K. Home Secretary Alan Johnson has confirmed that the National Identity Register contains National Insurance numbers and answers to “shared secrets.” In a revelation that is likely to intensify the arguments over the privacy implications of the database, Johnson claimed the NI numbers have been included to “aid identity verification checks for identity cards and, in time, passports.” They could also be used to cross-reference the register with other government databases, including tax and benefits. Kable reports that the answers to shared secrets chosen by applicants will be used to allow them to identity themselves over the phone. Johnson said this method, commonly used by banks, would speed up the reporting of lost or stolen documents or a change of address. He was responding to a written parliamentary question from shadow home secretary Chris Grayling, asking what information will be held on the National Identity Register which is not held on the U.K. Passport Database. Johnson said the information held on both is similar, but that in addition to NI numbers and shared secrets, the register holds fingerprint biometrics, which will be required for passport issue in future, and a unique national identity registration number. He added that between 20 October and 10 December last year more than 2,400 people had voluntarily enrolled, or made an appointment to enroll, for an identity card. The Home Office has now begun to require skilled foreign workers to register for ID cards when renewing their visas — three months earlier than it had originally planned. 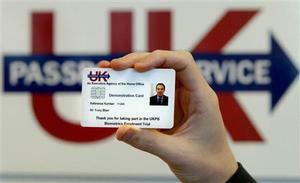 It has estimated that this will lead to an extra 40,000 foreign nationals being issued with the cards each year.